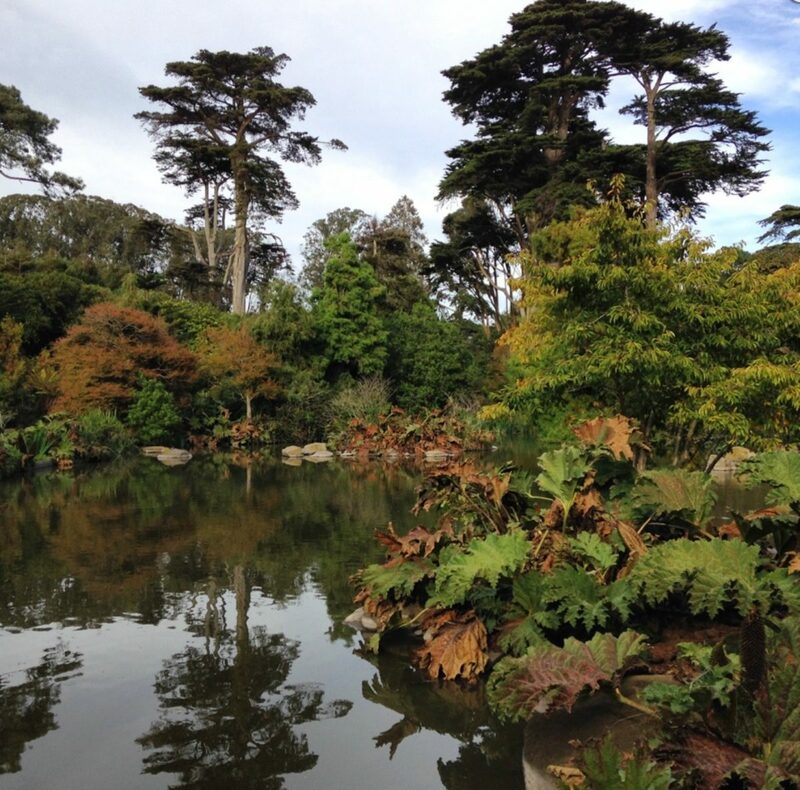 San Francisco Botanical Garden became an ACS Reference Garden in 2014. In the Garden’s own words, ‘conifers are among [our] cornerstone plants…framing our vistas and truly setting the tone for our 55 acres of plant life’. SFBG has a mild, maritime climate that allows a wide range of species to flourish. The native Pinus, Sequoiaand Cupressusgrow side by side with a large and diverse collection of Podocarpaceae and Araucariaceae; there is a lush and extensive redwood grove, a dwarf conifer collection and a grouping ofMetasequoia glyptostroboidesthat was planted from seed in 1950, making them some of the earliest plantings of this species in the U.S. All told, the collection includes over 250 conifer species. 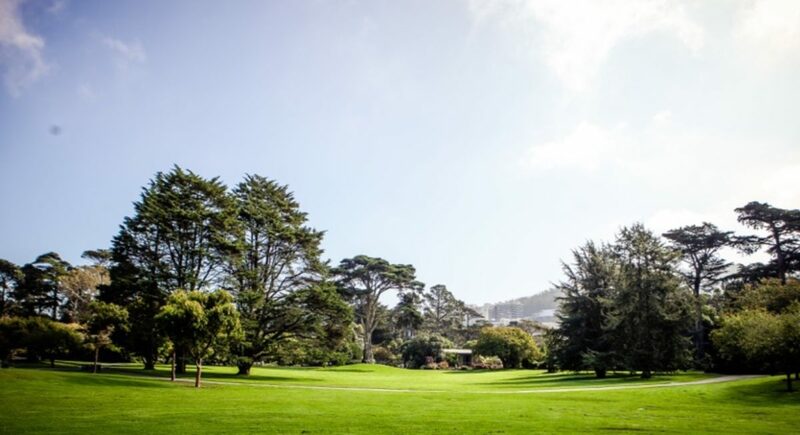 The Garden started as an arboretum, and the conifer collection began in the mid-1800’s with the planting of over 450,000 canopy trees to provide shade and protection from the wind. Two of the three species (the third was Eucalyptus globulus) were conifers: Cupressus macrocarpa(Monterey cypress) and Pinus radiata(Monterey pine). While the size and stature of many of the remaining specimens is impressive, due to their age they frequently fall prey to high winds and winter storms. Large limbs and indeed even entire trees are lost with increasing frequency. In 2009, the Garden created a canopy succession plan to coordinate the replacement of the three main species. Several hundred new taxa have been identified as appropriate. Some of the conifers in the plan include Abies bracteata, Agathis australisand Pinus torreyanassp. insularis. 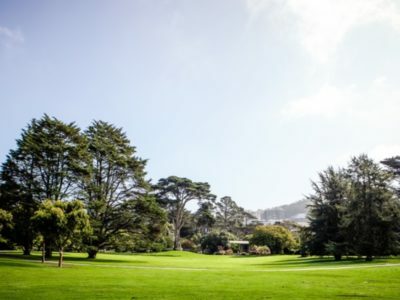 SFBG recognizes four key conifer collections in addition to the canopy: the Nobel Dwarf Conifer Garden, the Dawn Redwood Grove, the Conifer Lawn and the Redwood Grove. Many of the trees in the collection have grown to significant size. Among some of the oldest specimens (in addition to the canopy) are the Sequoia sempervirensin the Redwood Grove, which were planted around the turn of the 20th Century and the enormous Monterey cypress in the middle of the conifer lawn, which stands over 100 feet tall. 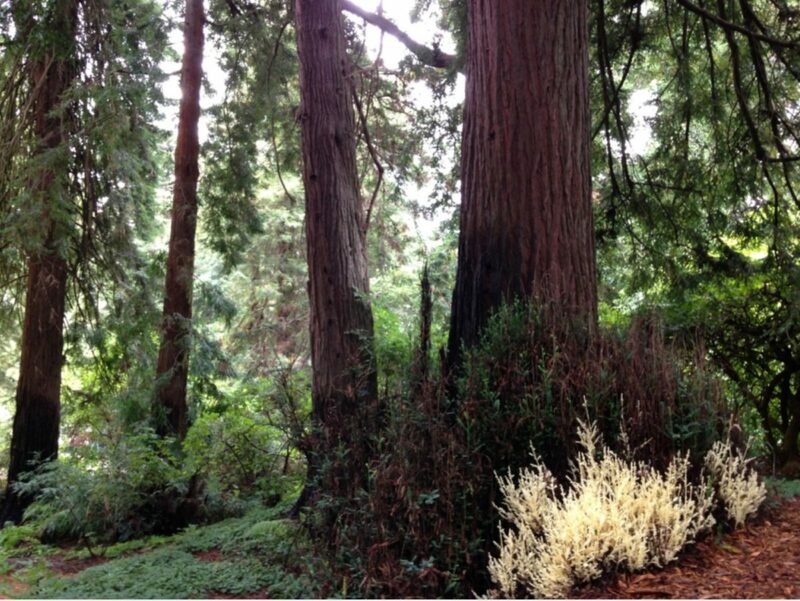 The Redwood Grove is the only place to view a redwood forest in San Francisco and it includes a rare albino form of the species. 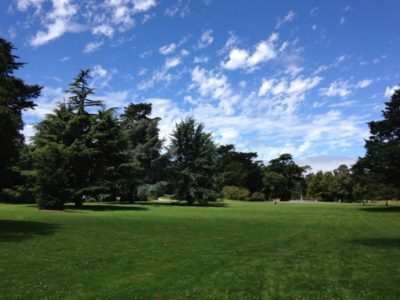 The Conifer Lawn includes over 30 species of conifers, including Abiesand Piceaspecies as well as a stately Sequoiadendron giganteum (giant sequoia). The oldest Sequoiadendronspecimen has developed a spreading windswept appearance as it grew in strong ocean winds for the first 50 years of its life. 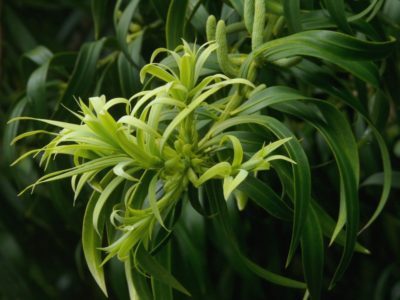 Later planted specimens, more protected by the more mature canopy, are very upright. SFBG also has one of the oldest collections of dwarf conifers in a large US botanical garden. The James Nobel Dwarf Conifer Collection was created in 1960 with the gift of 372 dwarf conifer species by Effie V. Nobel. Mrs Nobel’s late husband, James, had amassed this collection over many years and at the time this was one of the most important collections of dwarf conifers in the country. Currently there are over 100 species remaining and ACS members accustomed to the very latest and most unusual cultivars will find many here that no longer are considered rare. However, it represents a good opportunity to observe much older specimens that most of us have in our gardens! 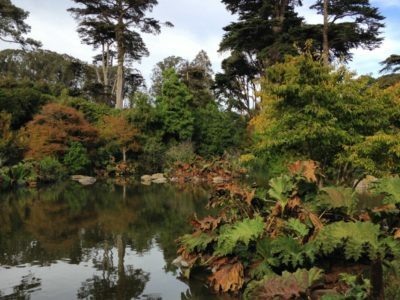 Although not recognized as a separate conifer collection by the Garden, one of the most interesting places to view key specimens is in the SFBG’s Ancient Plant Garden. This Garden is laid out so that visitors move chronologically through five periods: Early Devonian, Pennsylvanian, Jurassic, Cretaceous, and Eocene. 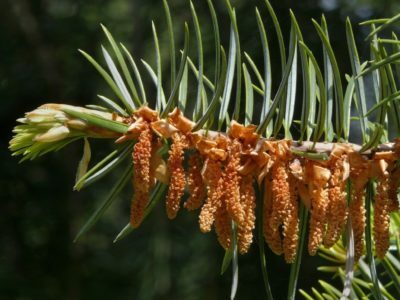 The Jurassic epoch is of the most interest to conifer lovers, as this was when seed plants began to dominate and before Angiosperms evolved and ‘stole the show’. 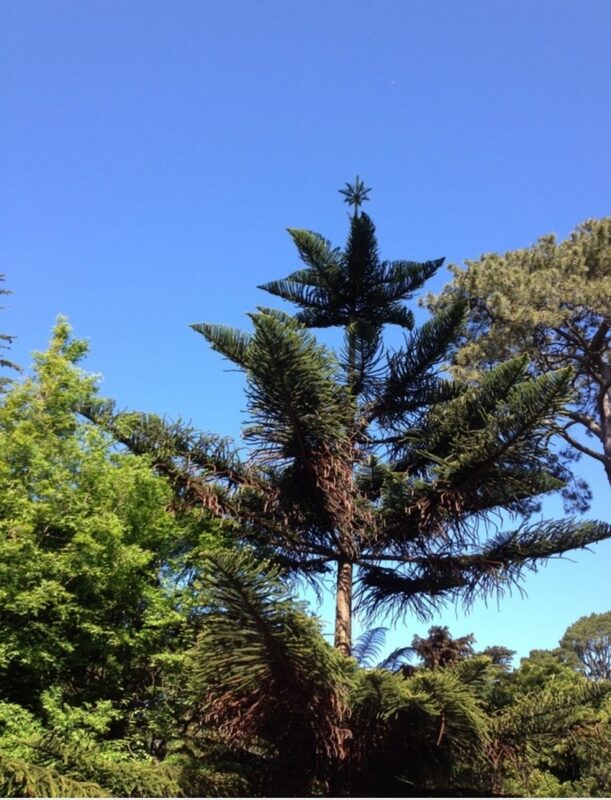 Here we can see Podocarpus, Araucaria and Agathis. 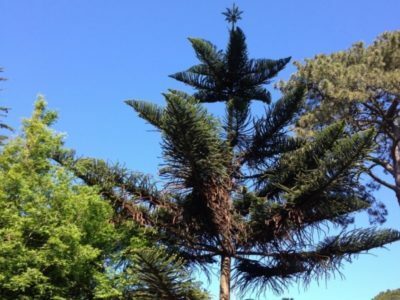 There are wonderful specimens of Araucaria heterophylla,numerous Ginkgo biloba, a Retrophyllum rospigliosiiand lovely Wollemia nobilis, the Australian conifer that was thought to be extinct until a small grove was found in a remote area in 1994. When wandering in this area, without too much imagination, it is possible to travel back to a time before flowering plants existed! See website for admission fees, directions, maps, etc.